Now that we have children and are homeschooling I still try to go to conventions when I can. I’ve learned several interesting things during my years of attending conventions. I call them my 5 “C’s” of homeschool conventions. Connections – Through attending conventions I have made numerous wonderful connections with other homeschoolers, vendors, and local companies. It is fun to connect with other homeschool moms between sessions and in the vendor hall. I’ve also found it beneficial to connect with the vendors and reps for the various curricula publishers. I love having my questions answered in person. And through attending conventions I’ve learned of some exciting local companies and vendors that offer services to homeschoolers. Confusion – If you are new to conventions and even if you aren’t, confusion is just part of wandering through the massive vendor hall and rushing to hear all the amazing speakers. To combat the convention confusion you need to approach your experience with a plan. First, before you get to the convention, go through the vendor list and highlight the vendors that interest you. Then rank them by importance – the ones you have to see in order to plan for the upcoming year and the ones you would love to stop by if you have time. Next, spend time familiarizing yourself with the speaker list through reading their bios and visiting their sites. Highlight which sessions you want to attend and which ones you’d like to get a recording. In choosing sessions make sure you allow yourself plenty of time to browse the vendor hall. You will initially experience some confusion and chaos at a homeschool convention. And this is normal….or at least it is for me. But enjoy! There’s nothing like a giant roomful of homeschool families, wonderful curricula, and encouraging speakers. Curriculum – Ok this is my favorite aspect of homeschool conventions. I have admitted numerous times that I have a huge curricula problem. Conventions don’t help me in the least! I love, love, love looking through all my options and paging through programs. You can look at online samples all day but there’s nothing quite like turning through the pages of the books and guides. I have left conventions with very different curriculum plans after seeing programs in person. Conventions are where I get ideas, plan for future years, or break my budget in a big, big way. This is my favorite part of the convention – seeing all the curriculum options and being able to flip through them and ask questions. Thanks to the many conventions I’ve attended I have found some wonderful curricula options for our family and this year we are loving every single thing we are using! Challenge – When you homeschool it can be easy to slide into a rut or stay carefully within your comfort zone. In the vendor hall and during speaker sessions you will be convicted, challenged, stretched, and pushed. It’s quite uncomfortable really. But it’s so very worth it! We need to keep things fresh, stay up on our own learning, have new plans, and have changed perspectives each year. Hearing the speakers and talking with other homeschoolers can force you to climb out of the rut you find yourself in and soar to a new level in teaching, learning, discipling, educating, and enjoying. Seeing curricula options can spark new ideas and can start you on wonderful rabbit trails of learning in your homeschool venture. You’ll find things you never dreamed of studying, and some might seem exciting and approachable. It’s fun to challenge yourself with different topics and teach the unfamiliar. The homeschool convention is about self-education as well, equipping you with ideas and new tools for another year. Contentment – If you’ve survived a homeschool convention I hope you’ve come away encouraged, uplifted, and ready for a new year. But most of all, I hope you experience contentment. After each convention I’ve experienced such wonderful contentment with our homeschool journey. I’ve made new connections, navigated through the confusion, found exciting new curriculum, and been challenged by the many speakers. Once I’ve had time to process my convention experience, I sense a deep accomplishment and contentment. This homeschool life is not an easy one but it’s what our family has been called to do. No matter how long are days are or how frustrated I might feel, I know that I’m right where I need to be for this season of my life. 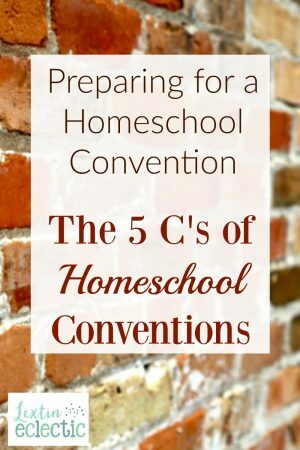 Conventions are a budget-busting, confusing, overwhelming, yet wonderful source of challenging conviction, encouraging inspiration, and contented reflection on this blessed but difficult homeschool life. Are you ready for convention season? ?